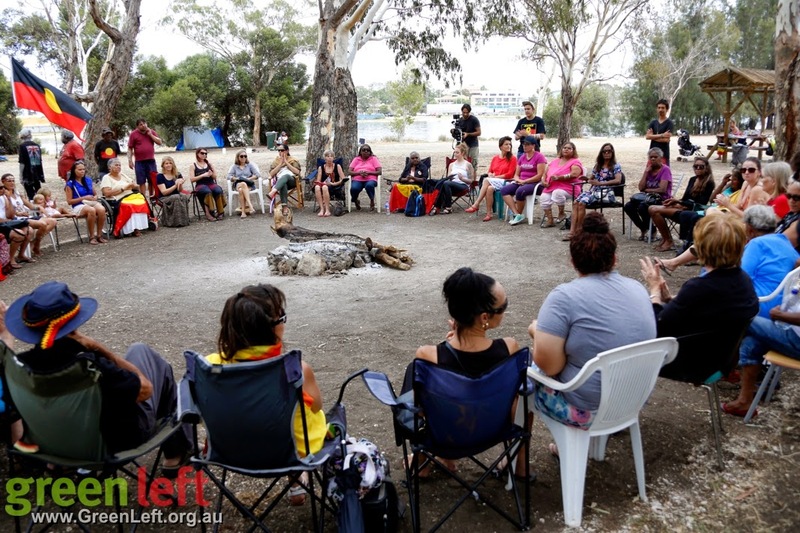 Matagarup was the site of the 2012 Nyoongar Tent Embassy, which was inspired by the 40th anniversary of the Aboriginal Tent Embassy in Canberra and the revitalisation of a national movement for Aboriginal sovereignty. 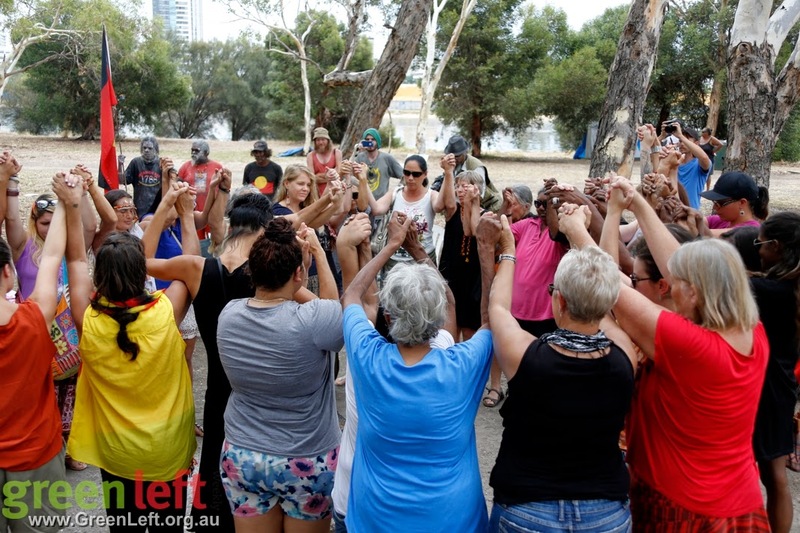 It was also a protest against a proposed deal between the Barnett government and the South West Aboriginal Land and Sea Council to extinguish Nyoongar native title in return for a cash and land package. This time, the encampment has described itself as a “refugee camp”. Participants believe that this makes it possible to get extra protection and support from the United Nations. It is also a reaction to the current moves by the state government to close 150 remote Aboriginal communities. The argument has been made that closure of communities will result in an influx of people with nowhere to go. A sign at the camp said it was for all “homeless and displaced persons”. 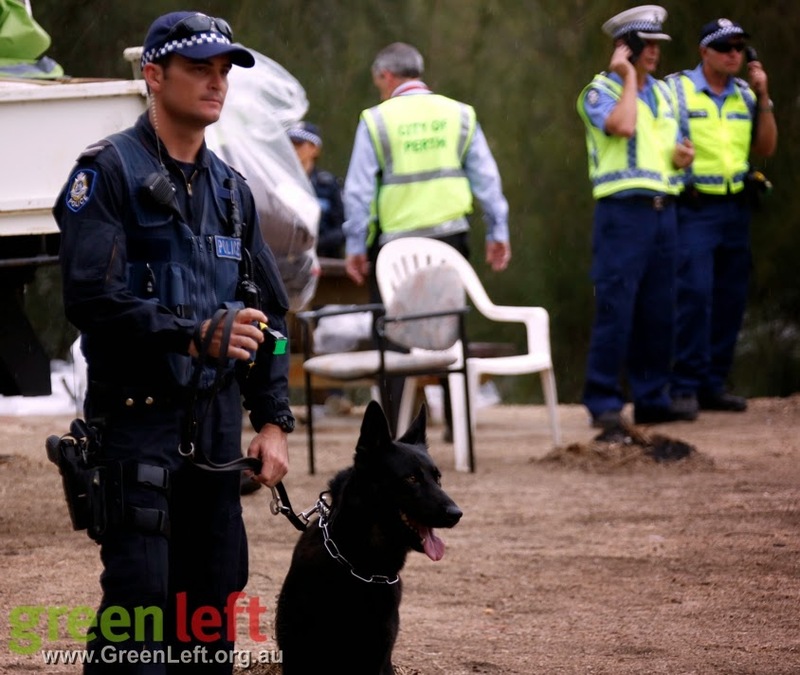 Participants told Green Left Weekly that it is sad that Aboriginal people are “refugees in their own country”'. A ceremony was held on March 8 to mark a full seven days since the “refugee camp” was established – a time when participants believed that United Nations protections kicked in. 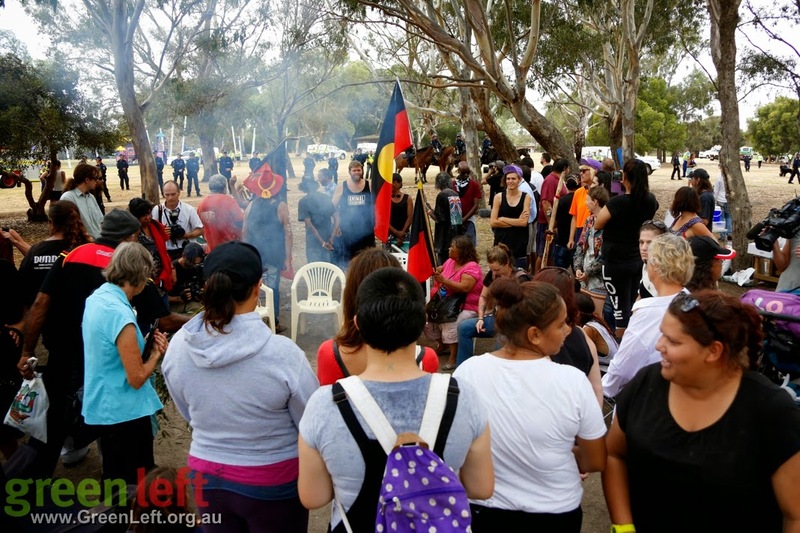 However, Perth City Council issued an ultimatum that any permanent structures at the camp must be dismantled by March 12. After a meeting on March 11, the council offered a 24-hour extension. One hundred people gathered for a ceremony at noon on March 13. 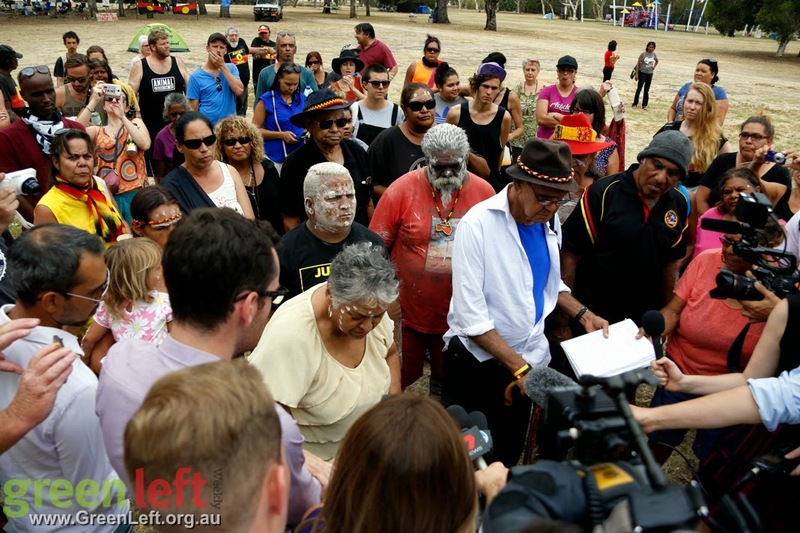 People spoke about the need to resist the state government's attempts to close remote communities. Maureen Culbong spoke about the importance of the camp and the meeting with the council two days before. Bella Bropho recounted the story of the closure of the Swan Valley Nyungar Community in 2003 and said it was the first community closure. Marianne Mackay emphasised the importance of the sovereignty movement. She said there is nothing anyone could do to end Nyoongar sovereignty over their land. At about 2pm it became clear that police were going to move in. Police scouts passed through and then an “incident response van” pulled up in the car park. 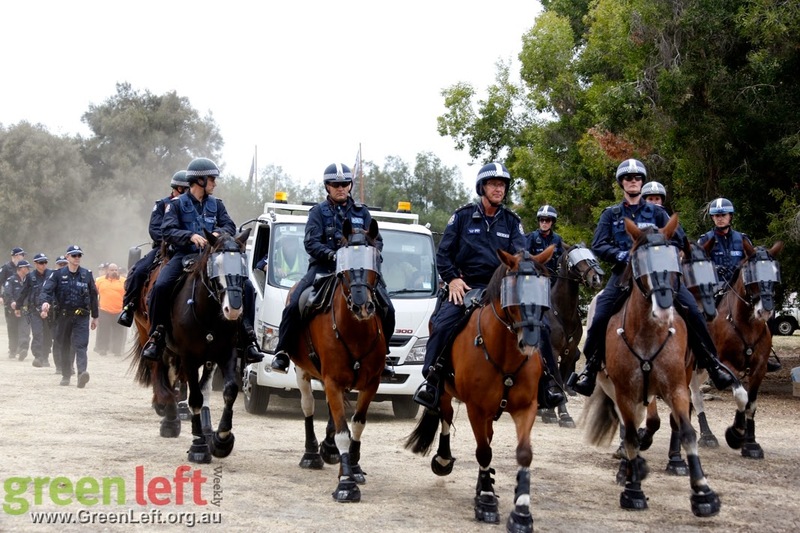 When police arrived at 3pm, together with horses, dogs and two big trucks. They targeted “structures” – that is the few tents that had been left standing. They seized picnic tables, mattresses and a pram and put them in the trucks, presumably for disposal. While this was happening, a number of the Aboriginal flags were turned upside down as a sign of distress. People gathered around the sacred fire but did not in any way disrupt the police operation. The fire was built up and it was considered that protecting the fire was the most important goal. The fire brigade was called and made a big show of spraying water on some unused campfires, but the police made no attempt to move people or put out the sacred fire at the centre of the camp. This was considered a significant victory by camp participants, and a marked difference from previous police operations. While some tents were seized, there is a clear intention to stay on the island. A meeting has been called for 9am on March16 on the island. In addition, a protest against forced community closures has been called for March 19 in Perth city.